One of my pet hates is people who walk around bookshops with their phones out. In the general sense I find it rude – if you're in a bookshop you should be looking at the books – but the main thing that bugs me is when people wander around taking photos of the books. Sure, the odd picture is probably a good reminder for a later bookshopping trip, but when I find myself stood next to a browser who's indiscriminately photographing covers and barcodes like there's no tomorrow I get more than a little annoyed. I'm British, so I obviously quietly fume rather than actually confronting them for their rudeness, but I like to hope my disdainful looks have stopped more than one internet shopper in the middle of a browsing session. So what does my ineffective rant have to do with this week's bookshop? First up, I'm a bit of a hypocrite. Because I don't want booksellers to know I'm visiting to write about their bookshop I wander around sneakily taking photos with my mobile phone, although in my case the photos are of the shop, rather than the individual books. The main reason for my comments is because they'll hopefully help to explain the state of mental discomfort I was in when I got to the third bookshop on my latest Books are my bag bookshop crawl. By the time I arrived at Pages of Hackney my phone battery had nearly died. Because I'm used to the poor performance of smart phones I was carrying a spare battery, but a dodgy cable meant the only way I could get it to charge was by holding phone, battery and cable at a certain angle in front of me while I explored. There are worse things to suffer, but at that moment I've never been so uncomfortable in a bookshop. 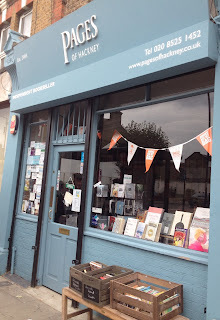 Fortunately, Pages of Hackney is a friendly place, and as the only passive-aggressive person in the room was the one holding the phone, no one frowned at me or told me off. Instead, everyone was happily browsing and I gradually managed to relax into this boutique bookshop. At the time of my visit the downstairs was closed for renovation so I can only comment on the main bookshop space, but even with reduced shelving I liked what I saw. 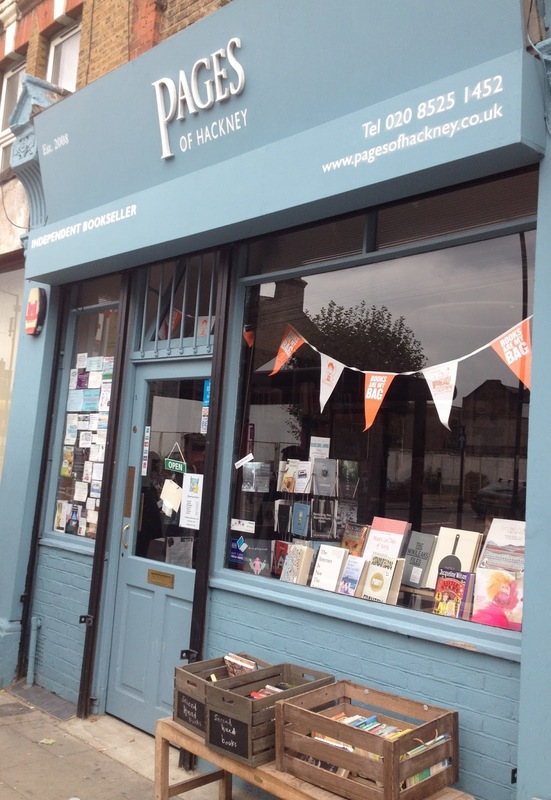 Pages of Hackney is a small and modern new bookshop, and what it lacks in quantity it definitely makes up for in quality. Eclectic is the word I'd probably use for this bookshop, because there must surely be something for everyone as classics sit near modern fiction, with even a shelf of science fiction to keep me happy, not forgetting a children's corner, young adult and all the usual non-fiction too. I really don't know how they fit it all in while still keeping the bookshop feeling light and airy. It was the recommends table that really caught my attention. Initially for the quality of books, but then also because I realised I could put my phone and charger down without getting in anyone's way. At the time of my visit I'd previously encountered very few of the books displayed, which is an increasingly rare occurrence for me and one that has to be savoured. I loitered by the table, enjoying sampling the books on offer and wishing I didn't have a one-book-per-shop rule. 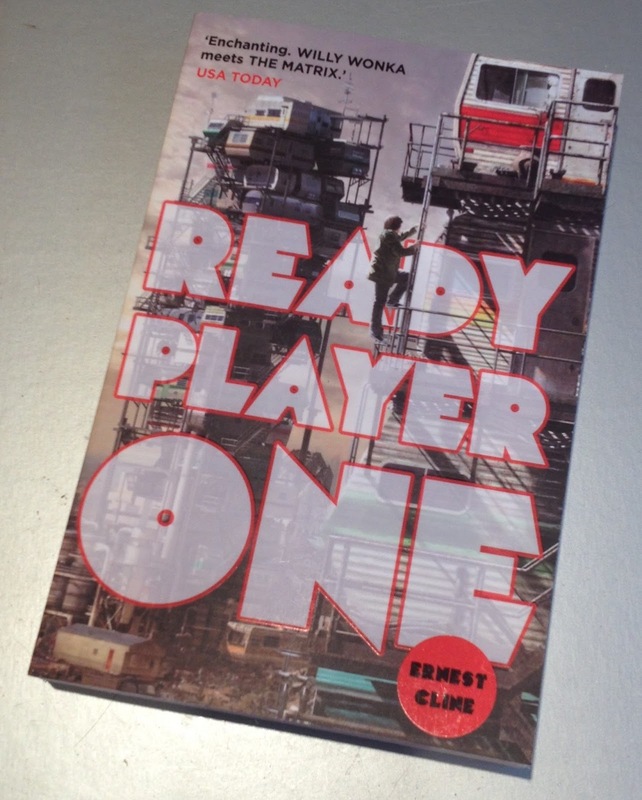 Ready Player One by Ernest Cline kept my attention the longest, and so it was this novel that came to the till with me. 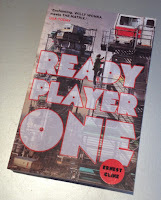 The bookseller was as friendly as all the recommendations* had told me she would be, praising my choice of purchase and – as a true hero – giving me directions to the nearest phone shop to replace the cable that had been giving me a headache. Pages of Hackney may only look small, but from my visit I could see it was a great little shop. Throw in events, great stock** and a friendly bookseller and this little shop appears to be a big part of its community. It's also welcoming to all, even those of us rude enough to be browsing while attached to our mobile phones. * I've lost track of the number of times Pages of Hackney has been recommended to me by Londoners. ** I believe the basement has now opened as a 'vintage' section, I must re-visit soon to find out.